You are here: Home>England>North East>Fly the Flag - Get Our Drift? The village of Waterhouses was a thriving mining village until the 1950s with six drift mines. Many of the houses were demolished in the 1960s following the village’s designation as a category ‘D’ village by the Government. Closure of ALL the mines in County Durham has seen the disappearance of many miners’ banners. Waterhouse’s own banner was created in the late 1800s and was thought lost, but subsequently traced to a nearby village, in a poor state of repair. The banner, which illustrates Aesop’s fable ‘Strength in Unity’ has now been restored by the project and is proudly displayed in a specially designed case in the village hall. They have carried out an oral history project, recording the memories of the village’s older residents and, drawing upon these stories, they have produced an animated film with the help of a filmmaker. 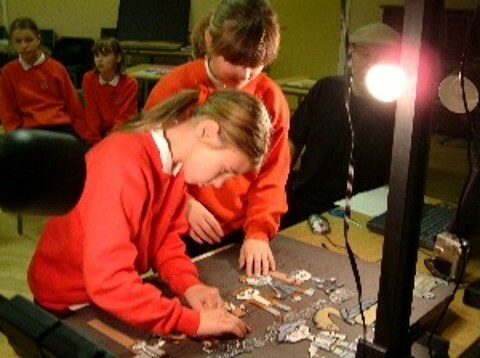 The two local schools were involved in the production of the drawings and animation, whilst members of the community produced and animated the clay characters that narrate the story. The film has had several showings to very well attended, appreciative audiences in the village hall and has been entered for the Young Film-Makers Film Festival in Teesside. The Waterhouses own website will be continually updated with information, as this project has developed its own momentum beyond its original remit.